Neil Irwin has a good piece up on the NYT Upshot blog aiming to demonstrate why the recovery from the Great Recession has been so weak. He rightly highlights the drag of government spending, but I’d argue that if one narrows down on the question of how big a role has austerity played in slowing recovery, even Irwin’s numbers don’t quite capture it. Irwin’s method is to look at the various components of gross domestic product and calculates the average share of total GDP that they accounted for between 1993 and 2013. Then, he multiplies this average share by the Congressional Budget Office’s estimate of 2014 potential GDP to get the level that each of these components “should be” today. The difference between today’s actual level and what that level “should be” is then the contribution of the sector to today’s economic weakness. Using this method, he comes up with government spending accounting for 40 percent of the gap between today’s actual versus potential GDP. This is definitely a useful exercise, but I have three quick thoughts on why this might understate the actual effect of policy-induced austerity. Irwin is not trying to estimate an austerity effect, but I just want to be clear that if one wanted to isolate the effect of policy-induced austerity, his numbers might be too low. First, there are multiplier effects, so if actual federal government spending was $118 billion higher today (that’s the gap between actual and “should be” spending identified by Irwin), then overall GDP would be roughly $180 billion higher. So, the policy decision to pursue austerity is costlier (in GDP terms) than just the difference between government spending levels. Second, lots of government spending doesn’t actually show up in the government category being tracked by Irwin. Government transfers—Social Security, unemployment insurance, food stamps, Medicaid, Medicare—are not classified as government consumption and investment spending in the GDP accounts. Instead, they show up as increased consumption spending. In the chart below, we include these transfer payments in our overall measure of government spending. Third, Irwin averages government spending over all phases of the business cycle between 1993 and 2013. But, during that time-period the economy spent a lot of time away from full employment. I’d at least want to measure from business cycle peak to business cycle peak (or trough to trough). Further, I’d argue that better policy proxy for the influence of austerity is to look at how the government has spent over equivalent phases of previous cycles. Put simply, government spending has tended to grow pretty fast in the first half of recoveries. Except for the current one. The chart below tracks overall government spending—federal and state, consumption/investment and transfers—over various recessions and recoveries. We center each business cycle’s spending series with an index equal to 100 on the recession’s trough. Looking to the right of this center shows the trajectory of government spending over the recovery phase of the cycle. 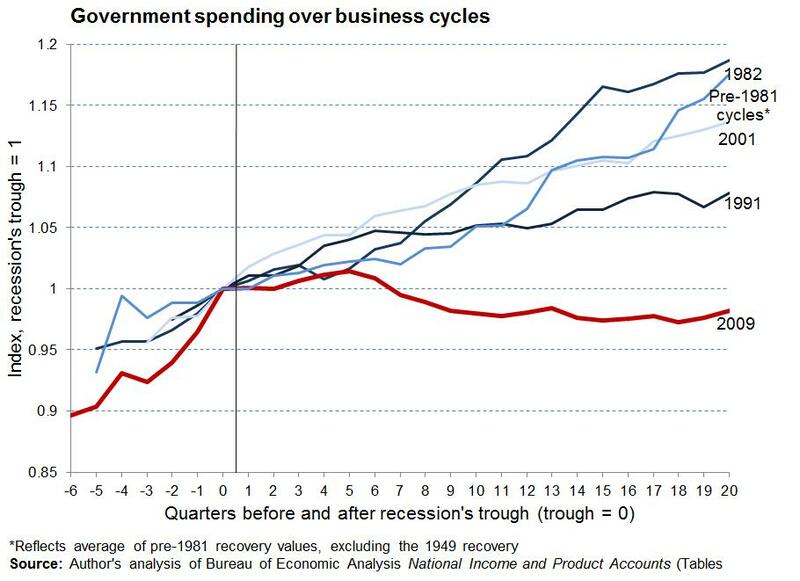 Looking to the left of the series shows the trajectory of government spending over the recession phase of each cycle. Irwin decides to look at data only since 1993. We can do that here—though it just allows comparison with one other recession—the one that began and ended in 2001. But, comparing government spending in that recession/recovery to the current one, overall government spending (including both the government consumption and investment flows tracked by Irwin as well as the transfers payments) would be 13.6 percent higher today if it grew at the same pace in the recovery following the 2001 recession. That’s just over $700 billion. Most of the political argument has centered on the recovery phase of this cycle, simply because the actual recession began before the Obama administration took office. Further, it’s really only been since 2011 that government spending has been a truly significant drag on growth. Before then, between the Recovery Act and what we have called “ad hoc stimulus measures” (like the payroll tax cut in 2010), we didn’t have real austerity until the fallout from 2011’s Budget Control Act (passed in the wake of Republican debt ceiling brinksmanship in summer 2011) began. But, even measuring from the previous business cycle peak—so fully accounting for the Recovery Act and the following ad hoc stimulus measures—overall government spending today remains 6.5 percent below what it would have been if it had followed its trajectory over the 2001 business cycle. This is about $350 billion (which is getting pretty close to Irwin’s number, pre-multiplier). Finally, two last thoughts these measures don’t fully reflect the magnitude of the policy error of austerity. First, the economy was much more damaged at the trough of the Great Recession than at the trough in 2001 (or 1991—or any post-war business cycle trough except for possibly 1982). Second, there was no room at all for conventional monetary policy to aid recovery at the 2009 trough. Short-term interest rates had already been at zero for nearly a year and yet the economy free-fell. These two considerations imply that smart policy-making shouldn’t have targeted similar increases in government spending during the 2009 recovery, but much larger increases. Instead, we ramped spending down and torpedoed a rapid recovery.